Cube Functions for Excel is a complete set of training material for developing powerful reports and dashboards from mulch-dimensional data in Excel 2007 and higher. 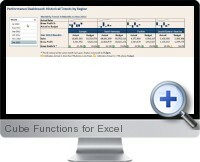 Cube Functions for Excel training material includes Excel workbook examples, sample database, PDF documentation and demonstration videos to utilize cube functions for analyzing data from Microsoft Analysis Services cubes, Power Pivot for Excel (2010), Oracle OLAP cubes and Teradata OLAP Connector sources. Build dynamic reports and dashboards using Excel cube functions. Data and report presentation remain separated, drastically reducing the potential for errors. Make reports more robust, easier to maintain and re-usable. Add drop down lists to make report parameter selection easier for users. Add functionality to check report results and highlight discrepancies. Utilize Excel's built-in charting capabilities to create dynamic dashboards that convey at a glance the values, trend and status of key performance indices pulled from centrally stored data sources. Automate report printing using VBA routines. Debug formulas, work with nested dimensions, manage member properties, work with multiple data sources and add additional data rows and columns to existing reports. Convert legacy 'copy and paste' reports to cube function reports. Use Power Pivot for Excel as a data source to aggregate millions of rows of data from multiple Microsoft and non-Microsoft sources. The enables the efficient creation of powerful business intelligence applications. Set up reports so they are dynamic when published to Excel Services in SharePoint.